Hakonechloa macra performs well in shade. 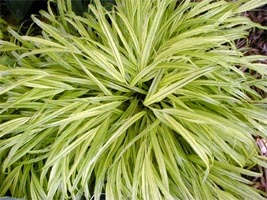 There are few grasses that perform well in the shade that also have ornamental value. 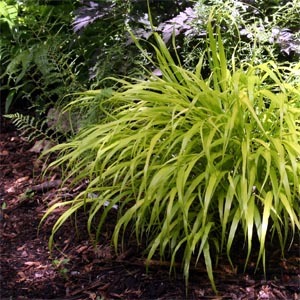 One of the best is Japanese Forest Grass or Hakone Grass, Hakonechloa macra, particularly its distinctive variegated or colored-leaf cultivars. Originally from the wet, rocky cliffs in the mountains of the Tokaido district of southeast Honshu, Japan (where its common name is urahagusa), this is the only species in this genus in the grass family (Poaceae). 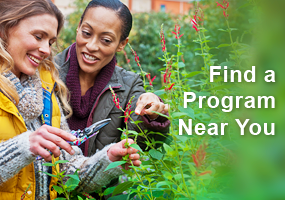 The species is hardy to zone 4, while the cultivars may be less cold hardy (many are listed only to zone 6, but certain ones have survived for years in zone 5 gardens). The slender, arching leaves give the effect of a tiny bamboo. This slow-spreading perennial grass forms loose cascading mounds that provide dramatic textural contrasts with other shade-loving plants. Its arching form with the leaves tending to flow in the same direction makes it reminiscent of a cascading waterfall. Even though it is a creeper, it is never invasive, spreading by underground rhizomes. It is a relatively slow grower and may take a while to become established. Clumps can eventually get 2’ high and 3’ wide, although they often stay smaller than this. 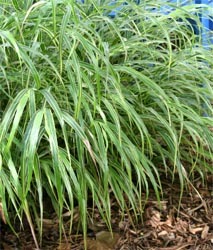 Slender, arching, linear green leaves grow 12-36” long on wiry stems, giving the effect of a tiny bamboo. Variegation in the cultivars is affected by the conditions the plant is grown under. They produce the brightest yellow-gold foliage in partial or dappled shade, but will also grow in full shade where the color fades to lime green. The color bleaches to creamy white when grown in full sun in cool summer climates (in hot climates they tend to burn in full sun). In the fall, the foliage takes on an orange to reddish cast, then turns light brown before collapsing in winter. Unlike many other ornamental grasses, this species does not remain standing to provide interest in the winter, but dies back to the ground. In mid- to late summer, small airy inflorescences appear between the leaves, but the cultivars do not produce viable seed. In the fall the flower stalks turn orange or bronze. Grow H. macra in humus-rich, well-drained soil. It performs best in an evenly moist soil, especially during its initial spring growth cycle and during hot weather. Although it generally is grown in partial shade, in the cooler climates of the upper Midwest it can be grown in full sun. It is relatively slow to reappear in spring. The golden and variegated cultivars brighten up shady or woodland gardens. This grass looks equally good as a single plant for a focal point or planted in drifts. 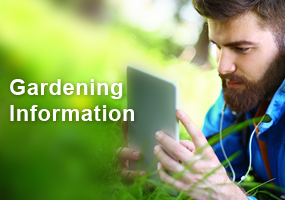 It combines well with larger, deep green or blue-leaved plants, such as Hosta, ferns or mugo pine (Pinus mugo). Create eye catching combinations by planting near dark-leaved Heuchera (such as ‘Cathedral Windows’, ‘Obsidian’ or ‘Plum Pudding’), green mottled Pulmonaria, or green or silver Brunnera. 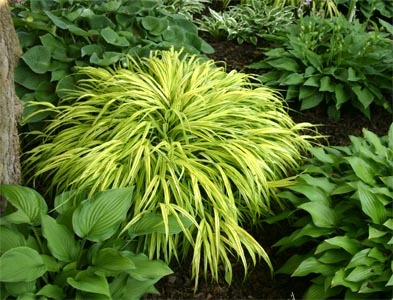 Create a color echo by combining with other golden-leaved or plants of different form such as Hosta ‘Sum and Substance’ or yellow bleeding heart (Dicentra spectabilis ‘Goldheart’) or variegated hostas to bring out the gold or cream variegations of the grass. Use gold or variegated forms as a backdrop for dark-colored flowers, such as dark purple ‘Queen of Night’ tulips or Astilbe ‘Burgundy’. 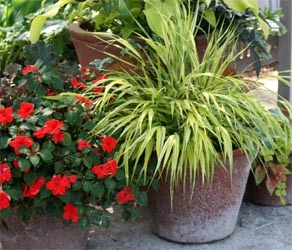 Hakone grass grows well in containers. H. macra can be used as a ground cover for shady areas or in containers cascading over the sides like a waterfall. (It will not overwinter in an exposed container above ground, however – bury the container in late fall or move it into a cool, sheltered spot, such as an unheated garage, for the winter.) This grass is a wonderful accent alongside water gardens, dry steam beds, near a path, or at the base of a tree or post, or amid larger rocks in a rock garden. Try it on the top of a wall or terrace where it can cascade over the edge. It is an excellent addition to an Asian-style garden or can be used to provide a somewhat tropical look and feel. 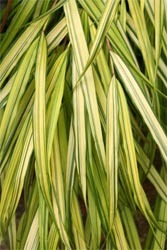 Variegated leaves of the cultivar ‘Aureola’. This grass has almost no insect or disease problems and is not favored by deer. Divide clumps in spring just as new foliage emerges, every 2 to 3 years or as necessary to propagate. After transplanting, they tend to “sit” for several weeks as they root out before putting on much top growth. 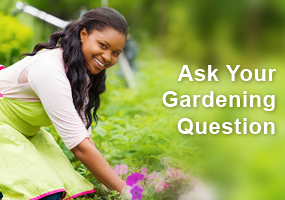 This grass requires little maintenance, other than cutting the dead leaves back in late winter or early spring. There are several cultivars that are more ornamental than the species, but they also tend to be slower growing, and less sun and drought tolerant. ‘Albostriata’ (=’Albovariegata’) – the green leaves have thick and thin creamy white stripes. It is more sun tolerant that the golden forms, is somewhat faster growing, and gets taller, to as much as 3′. It may also be more cold hardy than the other colored forms. ‘All Gold’ – a newer cultivar from Terra Nova Nurseries. It is brighter and more upright and spiky than other forms, and tends to be smaller and more slow growing. ‘Aureola’ (sometimes listed as ‘Alboaurea’) – this is one of the most common cultivars, and was even given the Royal Horticultural Society’s Award of Garden Merit. 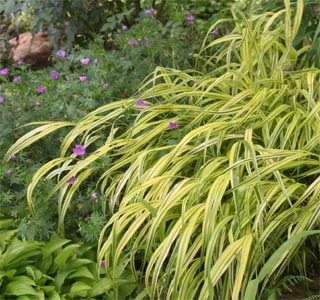 It has bright golden leaves with narrow green or chartreuse stripes. The autumn foliage is red-to pink flushed. ‘Benikaze’ – meaning ‘red wind,’ this cultivar is green through the summer, but takes on varying shades of red when the weather cools. My dad was a martial artist and his sensei growing up was from Okinawa. He later worked for MSU’s garden center. My dad always planted beautiful Japanese trees and grasses and they are so beautiful. We had a beautiful cherry blossom that was unfortunately taken down during a wind storm. What a beautiful post and images. Thank you! I live north of Seattle, Washington. One of my large clumps of Hakonechloa “Aureola is slowly turning solid green. The solid green stalks are not as waterfall-like as the variegated “Aureola” and because I don’t think the solid green stalks are as pretty as the variegated, I have tried to cut them out. Over the years the solid green leaves have become 1/4 of the clump. Have you ever heard of this happening? Perhaps I can dig out this part of the clump in the late winter before the grass sprouts up again. I’d appreciate any insights you may be able to share with me about this. I am in Puyallup and mine did the same. Took the shovel and dug out the solid green, will plant it elsewhere. Also, have some in pots doing the same, trying to revert to green, just cut it out. It commonly does this. can I grow it in zone 9? Lots of rain in summer winters tend to be dry. rarely if ever gets below 40 degrees? I’m wondering this same thing too… We both must be in Phoenix… I’d love to have this.